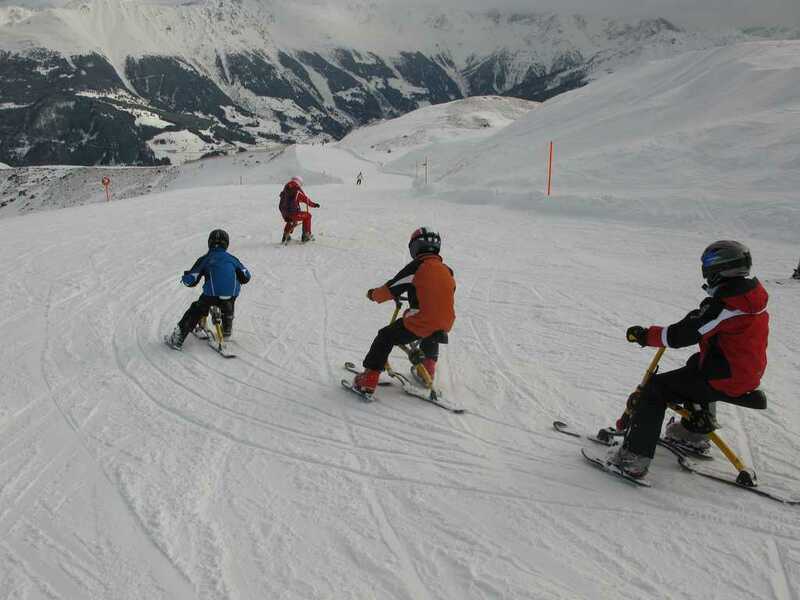 Skibobbing, also called skibiking or snowbiking,a winter sport using a guidable, single-track vehicle that has features of the bicycle, the bobsled, and skis. 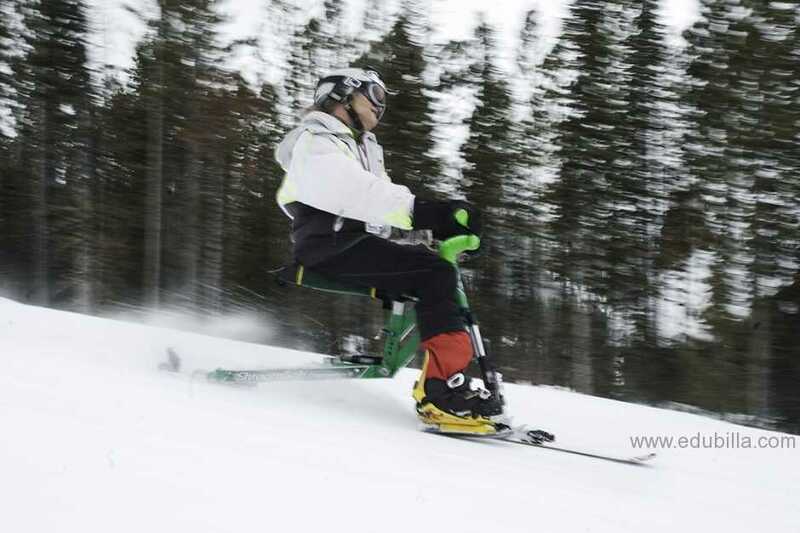 The longer rear ski is fixed, and the shorter front ski is mobile for steering; a saddle like that of a bicycle and a steering bar with handles complete the rig. The assembly is kept flexible to provide smooth passage over bumps and is lightweight, made of wood, aluminum, or plastic for portability. Traditional -- this is based on skis, and is ridden with foot-skis. Hybrid -- also based on skis, but ridden without foot-skis. BoardBikes -- this is based on a snowboard. Extreme or "other" -- this covers anything that doesn't fit into the first three categories; these are often home-built or modified. 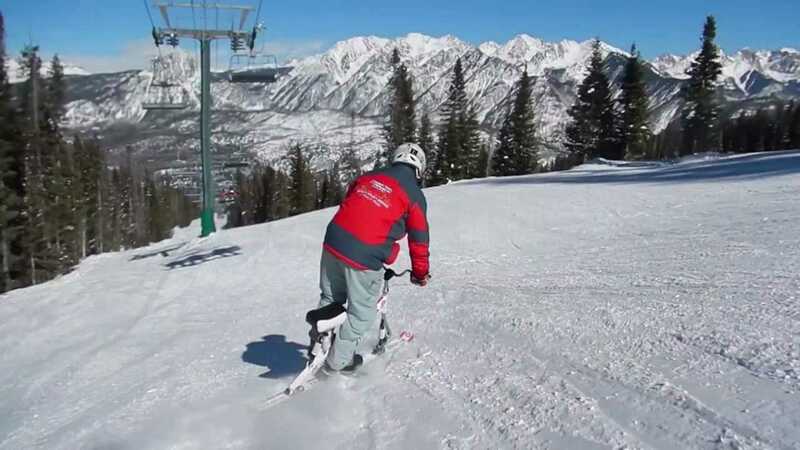 Skibob events include the downhill, the slalom, the giant slalom, and the super-giant slalom (also known as the super-G), with a course having, for the downhill, a minimum 365-metre (1,200-foot) drop for women and 600-metre (2,000-foot) drop for men. 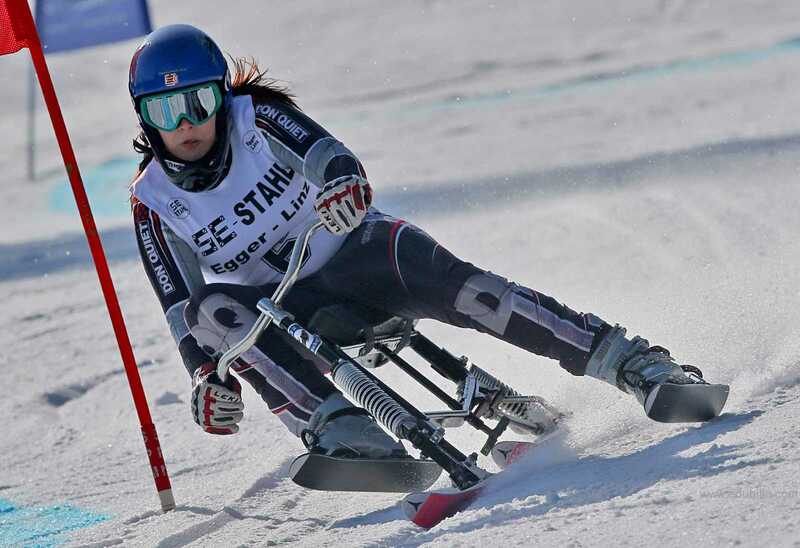 The giant slalom has a less severe drop and has 31 gates. Noncompetitive speeds range from 40 to 65 km (25 to 40 miles) per hour, but, on the downhill, speeds of more than 160 km (100 miles) per hour have been reached. 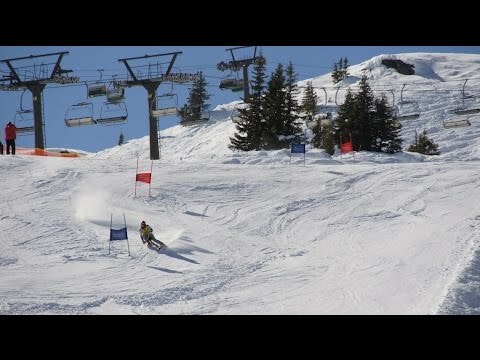 Ski-Bobbing competitions are similar to skiing competitions; control gates are used and races are timed. There are also "extreme" competitions, as well as high speed competitions. The current record is over 120 mph. skibobbing was one of the very few methods by which people without strength in their knees could alpine ski, but it soon became a popular sport amongst the physically able, too. 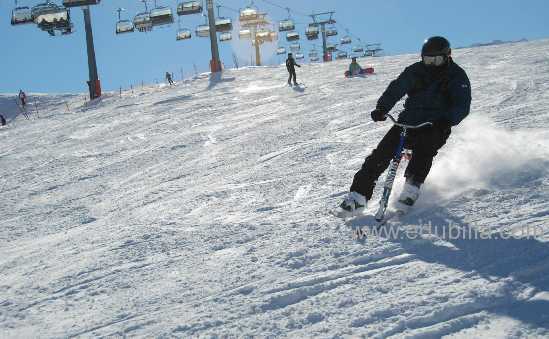 The main attractions are said to be the speeds attained (in some skibob giant slalom races, speeds can be reached of up to 120 mph or more) and the feeling of jet skiing on snow. 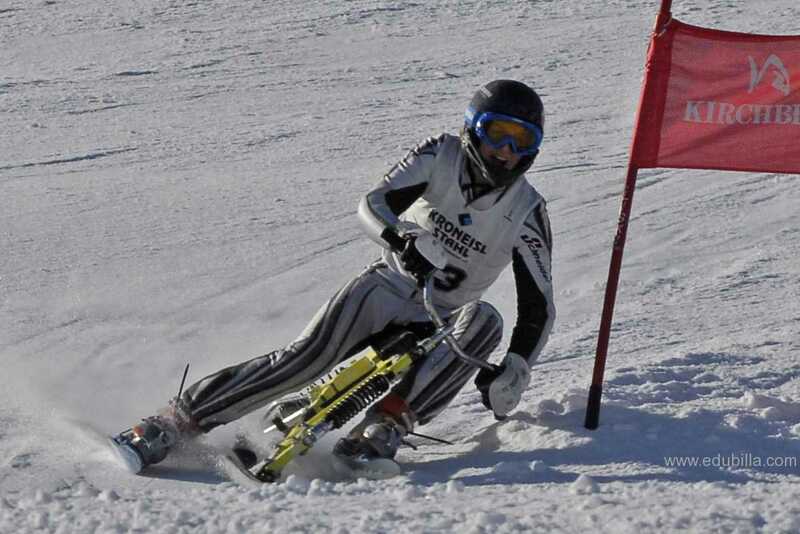 A skibob (which is somewhat like a snow bike capable of reaching 120 mph) to your feet and you just go. 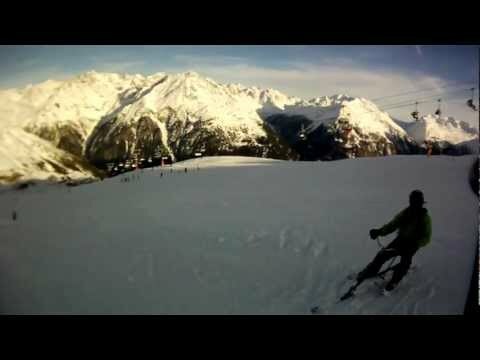 There is no way of stopping the skibob unless you crash or hit something. 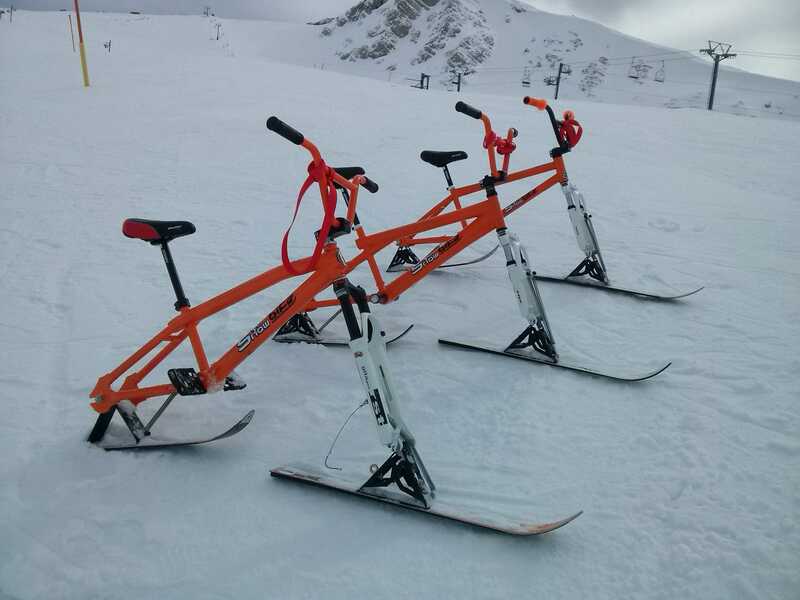 skibob bicycle-type frame attached to skis instead of wheels. 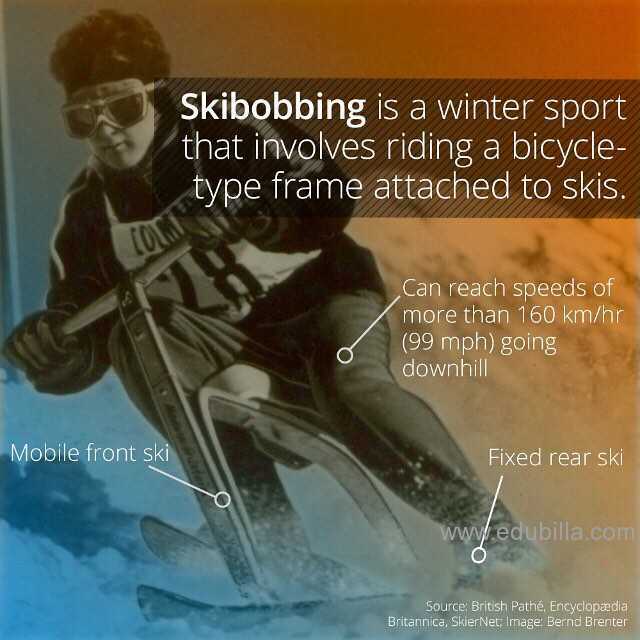 ski-bobbing, ski-biking, ski-toys, or some other descriptive name, the sport of "ski-bob" has existed for a lot longer than you might think. 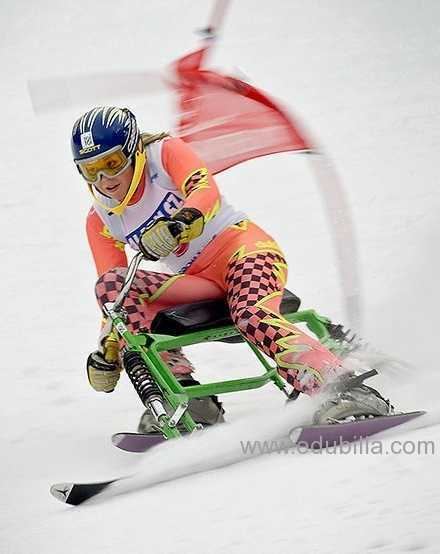 Although the first ski-bobbing device was patented in the USA in 1892, winter sports enthusiasts have been sliding downhill on contraptions other than skis for centuries. 1911-In 1911, the "Velogemel" was patented in Grindelwald, Switzerland. 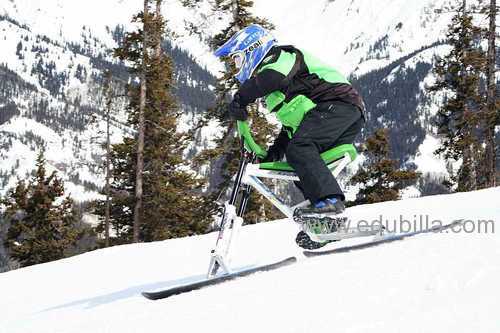 This is probably the first actual production skibike. 1960-The sport received a major boost in the mid 1960s when it caught on with some success in Europe. 1968-In 1968 the American Skibob Association (ASBA) was founded in Colorado, and put on demonstrations at Arapahoe Basin. 1970-By the early 1970s the bikes were outlawed at many resorts. The reasons why are not clear; perhaps liability issues, but more likely some run-ins with vocal skiers. Except for the core enthusiasts who carried the torch for ski-bobbing, the sport all but died out in the USA. 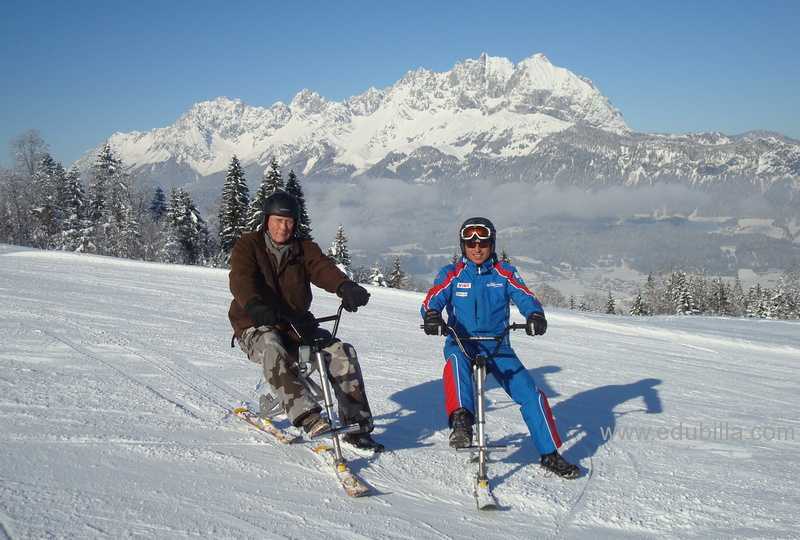 1949-On March 10, 1949, Engelbert Brenter, an Austrian ski manufacturer, obtained a patent for his "Sit-Ski". This device incorporated several innovative features. 1950-In 1950, the German engineer Ernst Reiss-Schmidt patented a design later to become the "Gfaellerei". 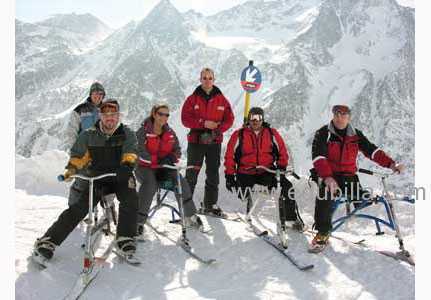 1961-The Federation International de Skibob (FISB) was formed in 1961. 1971-A World Championship competition event was held at Mount Rose, Nevada in 1971. 1839 - The Macmillan Velocipede was invented by Scotsman, Kirkpatrick Macmillan.MacMillan's velocipede was the first bicycle with pedals to drive the rear wheels.MacMillan has cemented his place in the history of bicycles with many crediting him with being the man who invented the modern bicycle. 1853-The Tricycle and Quadracycle were manufactured by Willard Sawyer. Sawyer made a variety of models, from a 6-seater family machine to a lightweight racer. His Promenade and Visiting model 'preserved evening costume' and he also made Ladies', Invalid's and Children's models. He built machines for the Emperor of Russia, the Prince Imperial of France, the Crown Prince of Hanover and numerous other members of the aristocracy. 1860-Lallement's Velocipede was invented by Frenchman, Pierre Lallement. 1870-The Penny Farthing or Ordinary Bicycle was invented by Englishman James Starley. This bicycle, with its large front wheel and smaller rear wheel, gave increased speed and a more comfortable ride for the cyclist. 1880-The League of American Wheelmen club was founded.The League grew substantially and by 1898, had more than 102,000 members, including famous names such as the Wright Brothers, John D Rockefeller and Diamond Jim Brady. The League of American Wheelmen was, (and still is today, under the name of the League of American Bicyclists), an advocate of cyclists rights and improving road conditions for cyclists. 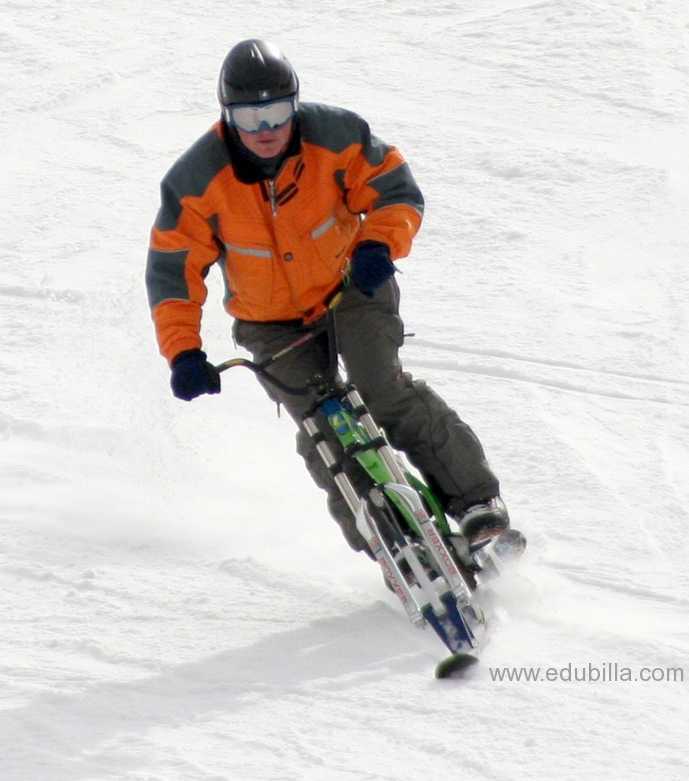 1892 - American, Mr. J. C. Stevens patented the idea of a bicycle where the front wheel was replaced by a ski, the 'Ice Velocopide'. 1946/7 - German Engineer, M. G. Gfäller obtained a patent for a "single track steerable sledge", and thus the 'Gfäller Ei' was invented. 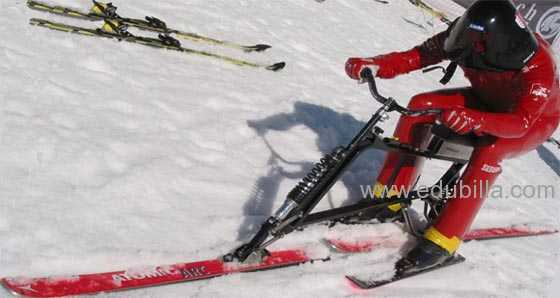 1949 - Austrian Engineer, Engelbert Brenter invented the 'Sit Ski'. 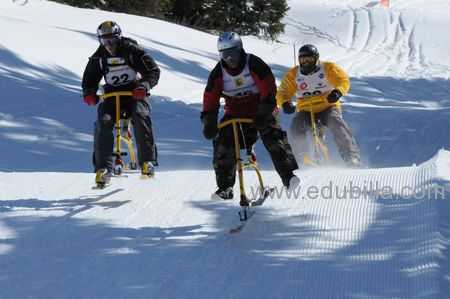 Skibobbing is a winter sport involving a bicycle type frame attached to skis instead of wheels. 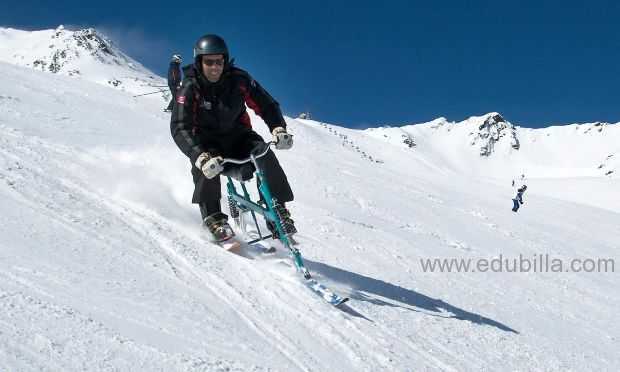 Although the original idea for a bicycle with skis was patented as early as 1892, and skibobbing had been a form of transportation in the Alps. The first skiboblike device was patented in the United States in 1892 and an Austrian device in 1902. Swiss mailmen and delivery boys used the device, but the sport did not develop until after World War II. In 1948 the German Georg Gefäller manufactured the Gefäller Ei (“Gefäller Egg”), which he called a skibob. The sport slowly became international as it spread from Austria to Switzerland, West Germany, France, Italy, and Czechoslovakia and then from Europe to the United States, Canada, Japan, and elsewhere. 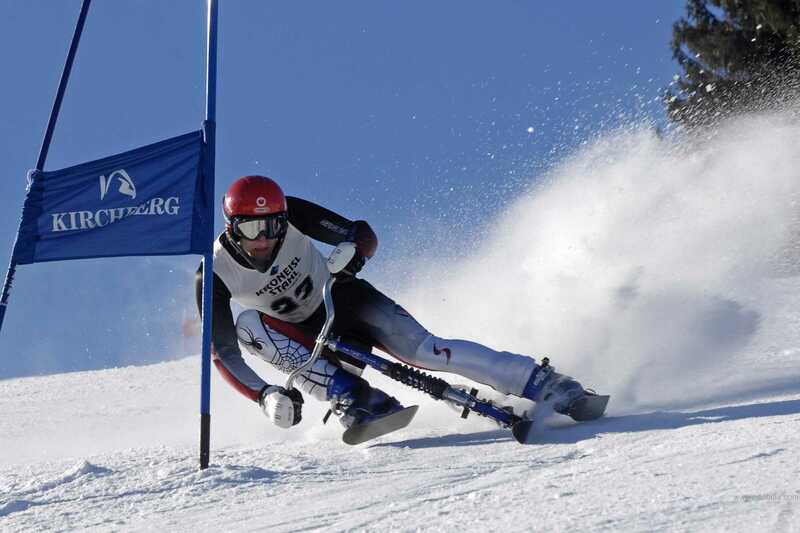 The SAGB (Skibike Association of Great Britain) was set up at the first World Championships in 1967 to help British racers. The FISB organized the first World Championships in 1967 and have continued to do so every year since. 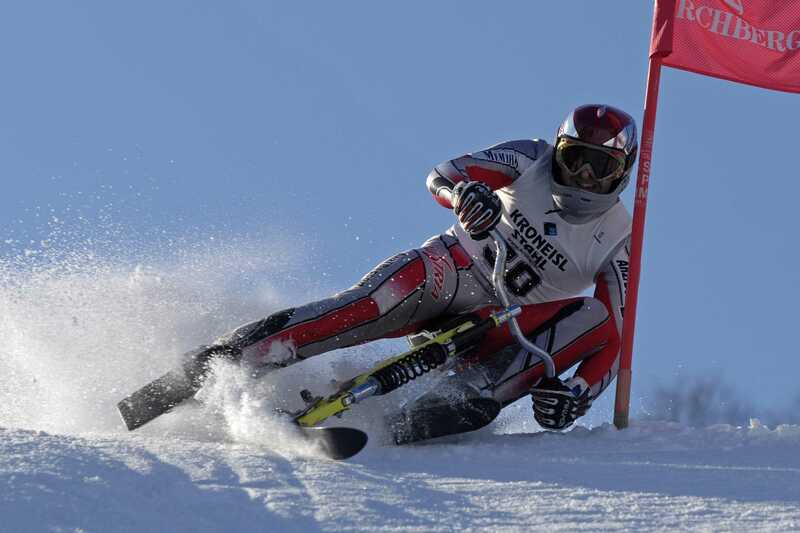 Nowadays there is also a World Cup circuit, similar to that in skiing and at the 2002 World Championships in Špinleruv Mlýn, Czech Republic, there were 14 different nations competing. 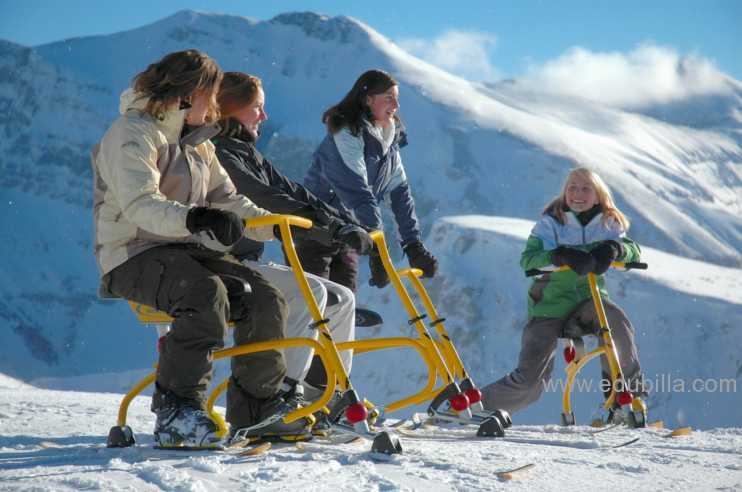 Fédération Internationale de Skibob was established in 1961 in Innsbruck The FISB has its headquarters in Salzburg, is under ZVR: 601768835 registered with the Security Directorate in Salzburg. 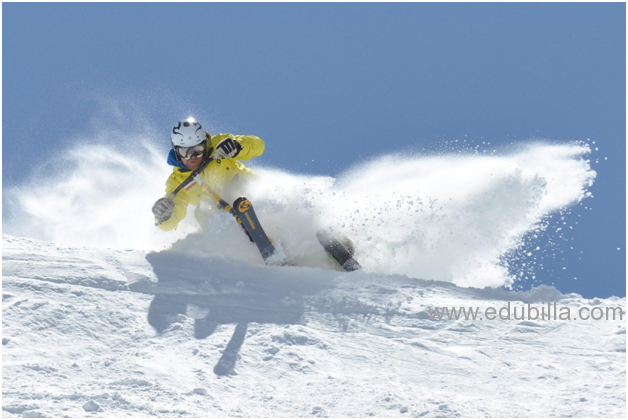 The bodies of the Federation International de Skibob are the Bureau and the FISB Congress. The FISB supports its member associations and their clubs. It is committed to the integration of sport in society, contributing to the quality of life and health. It promotes the motivation of the population to a regular exercise. It promotes the internationally oriented professional and amateur sports. It represents the interests of private legal sport in the world to the public, the authorities and national and international organizations. It supports the activities of its member associations and meets overriding tasks.